The People's Democratic Party, Osun State Chapter, today reacted to the relocation of the election tribunal to Abuja from Osogbo as a plot to deny the people of Osun the opportunity to observe the trial and to manipulate the sittings of the tribunal. The Chairman of the party, Hon Soji Adagunodo told The Nigerian Voice that the relocation of the tribunal was a fraudulent move and urged the National Judicial Council to probe the development. The party described the relocation of the sitting of the Osun Governorship Election tribunal to Abuja as another sign that there is a desperate and evil plan by some forces to implement a pre-written script on the proceedings and outcome of its petition before the tribunal. 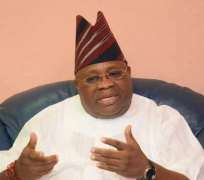 Also, the Governorship candidate of the Party, Senator Ademola Adeleke also told The Nigerian Voice that he was not informed of the logic behind the relocation of the Election Petition Tribunal from Osogbo to Abuja. The relocation of the election tribunal was announced via a one-paragraph memo posted on the notice board of the tribunal in Osogbo on Saturday evening. The PDP candidate frowned that no reason was given for the relocation of the sittings to Abuja, the Federal Capital Territory instead of the Osun State High Court in Osogbo, capital of Osun State where the three-man panel was sitting. Adeleke told The Nigerian Voice that he would not be deterred from reclaiming his mandate wherever the tribunal is sitting. "Irrespective of the geographical location of the Tribunal; the facts remain unchanged." "Our lawyers and professionals were ready to expose all electoral frauds committed by the All Progressive Congress and Independent National Electoral Commission to subvert the will of Osun people and we shall retrieve the stolen mandate", Adeleke said. The PDP in a press statement said "It was not shocked by the relocation of the sitting of the tribunal away from Osogbo, the State capital in view of the several boastings of prominent APC leaders to that effect in the last few weeks, it is very disappointing that a very important institution like the Judiciary would allow itself to be cheaply manipulated by unscrupulous elements in the political space." "The PDP recalled that the new panel was constituted in a very controversial manner by the President of the Court of Appeal whose family affinity with the All Progressive Congress has been an issue of concern to Nigerians who had wondered why the initial panel was disbanded without any justifiable reason." "We believe that the decision to relocate the Tribunal sitting to Abuja was also without any justifiable reason because there had been no reports on any security breach neither had there been any other cogent factor that could have necessitated the action." "The party said it was very probable that those who took the decision without consultation with counsels of the petitioners did so partly to prevent the good people of Osun State from observing the proceedings of the tribunal and also to make it easier for the Federal authorities to influence its outcome." "We want to remind Honourable members of the tribunal of the dictum of the eminent jurist Niki Tobi JSC that the true test of a fair hearing is the impression of a reasonable person who was present at the trial whether from his observation justice has been done". "We also reiterate that apart from the Court of public opinion which the conduct of the tribunal will be subjected to, there is also a burden on the tribunal members to justify the expectations of God from those who hold such sacred offices and who are called upon to do justice without fear or favour."